An alternative to TerraTac Polymer, TerraGlue is the value-engineered version of TerraTac Polymer. Like TerraTac Polymer, it is an eco-safe, biodegradable, liquid copolymer used to provide erosion control and dust suppression. TerraGlue is comprised of long, nanoparticle molecular structures that link and cross-link together to form strong bonds between particulates, soils and aggregates. The solution is designed to be easily applied topically to almost any soil or aggregate. A modest application will create a light surface crust that remains water permeable for air and water, yet perfect for controlling dust and suppressing PM10 and PM2.5 particulate matter to maintain air quality and visibility. 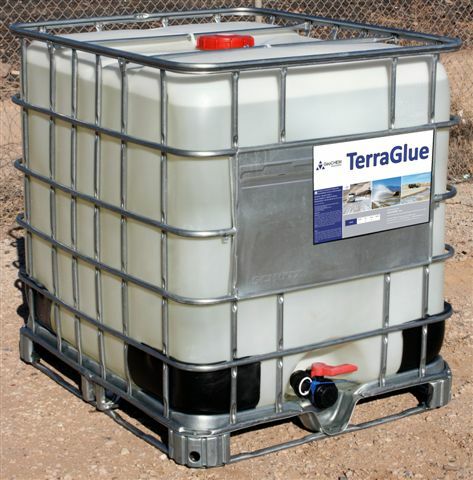 Increased applications of TerraGlue are highly effective for roads and other traffic areas. The product is designed to penetrate into the ground creating a strong and resilient, yet flexible, surface wear course that can withstand the intense abuse of vehicle traffic and environmental conditions.